There are 30 articles in this month. One hundred days, 16 countries, 12,000 miles—by motorcycle. In this second installment of Pat Sherwood and Ian Wittenber’s trip to Santiago, Chile, Sherwood talks about his motivation for hitting the road. “Every now and then, over a greater period of time, if I don’t do something that I consider bigger or on a larger scale or whatever, I just have an amazing sense of not being fulfilled,” Sherwood says. On Sept. 7, 2013, a fire in Sydney, Australia, took down three business, including CrossFit Iron Cove. Also affected were the Muay Thai and jiu-jitsu businesses housed in the same building. Jeff Tincher explains how the CrossFit Competitors Course helped him put Lindy Wall on a path to the CrossFit Games. On Episode 295 of CrossFit Radio, host Justin Judkins interviewed Shari Keener, who trained at the first CrossFit box and overcame addiction to create a new life for herself. This episode was webcast on Sept. 14, 2013. CrossFit Inc. has revolutionized the business of fitness, and now hosts of others are riding the wave. Chris Cooper reports. 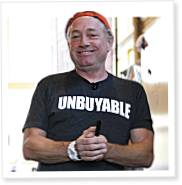 Greg Glassman introduced a new way to measure fitness objectively. When your Fran time drops or your front squat goes up, you’re getting fitter. In this first installment of Pat Sherwood and Ian Wittenber’s trip from Santa Cruz, Calif., to Santiago, Chile, things go wrong before the adventure has even begun. With 100 miles on his new bike, Sherwood is hit while riding on the highway near Santa Cruz. After a police report and visit to the doctor, though, he’s good to go.